Caroline Gallmeier, 92, of Delphos, passed away on Wednesday, August 01, 2018, at The Meadows of Delphos surrounded by her family. Caroline was born July 1, 1926, in Delphos to Claude and Carrie (O’Neil) Bergfeld. On November 24, 1949, she was united in marriage to Harold Gallmeier; he survives in Delphos. She is survived by one son, Joe (Tina) Gallmeier; four daughters, Kathy (Marc) Tirey, Joyce (Ed) Long, Mary (Ron) Reese, and Kelly (Jeff) Smith; daughter in law, Deb Gallmeier; eighteen grandchildren, Shane (Brenda), Travis (Kristy), and Kyle Gallmeier; Adam and Brian (Sarah) Tirey, Katie (Colt) Shape, Karissa (Brad) Cupito, Jen (Joey) Wildroudt, Ryan (Katie) and Daniel Long, Sam, Jack and Josh Reese, Nick and Brooke Gallmeier, and Tyler, Lydia and Paige Smith; eight great grandchildren; and one brother, Claude (Mary) Bergfeld. She was preceded in death by her father and mother; son, Michael Gallmeier; sisters, Gracie Bergfeld, Evelyn Mullen, and Mary Redding; brothers, Pat Bergfeld, and Eugene Bergfeld; and triplet grandchildren, Bryan, Ryan and Lisa Gallmeier. Caroline was a member of St. John the Evangelist Catholic Church where she had been a member of the choir and served on St. John’s School Board and Parish Council. She had also been a member of the Catholic Ladies of Columbia, and the Catholic Daughters of America, court 707. For many years she cooked at the rectory for the parish priests. Many will remember Caroline working for fifteen years at Helmkamp’s Meat Market, and fourteen years at The Delphos Food Locker. She cooked for many county fairs. Caroline and her husband, Harry, owned the Chew-Chew Restaurant in Delphos many years ago. Caroline loved her work, where she joyfully shared her knowledge and expertise of food, preparation, while also sharing her faith, and gentle, loving support and encouragement for life’s many ups and downs. Her home was open to anyone who might be hungry, sad, happy, or alone. No one left without a full stomach and heart. 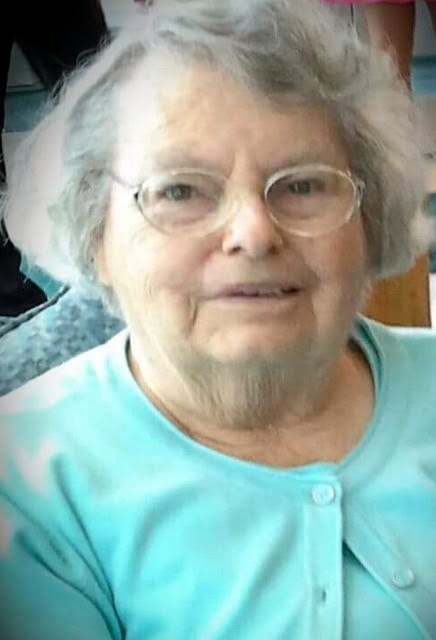 She is remembered for all the wonderful things that were prepared with so much love in her kitchen, especially her cinnamon rolls and chocolate chip cookies. She did it with an unshaken and devoted faith in our God. Her prayers were unending, and all who knew her were blessed by those prayers. She was devoted to her family, friends, and the community with an unconditional love and was a second “mom” to many. A Mass of Christian Burial will be held on Monday, August 6, 2018, at 12:00 p.m. at St. John the Evangelist Catholic Church. Burial will follow in Resurrection Cemetery. Visitation will be Sunday, August 5, 2018, from 2:00-6:00 p.m. at Harter and Schier Funeral Home with a parish wake at 5:30 p.m. In lieu of flowers, memorial contributions may be made to The Mike Gallmeier Foundation, 315 W. 5th St., Delphos, Ohio 45833.